Easy Outlook Express Repair (download - EULA) helps to avoid serious consequences of mailbox corruption. If your PC is unstable, you can have issues with mailboxes in Outlook Express format. The stability of dbx files depends on many factors. It should be noted, that Outlook Express has some vulnerabilities, especially in early versions of this mail client, that's why, you should take some precautionary measures. If you'd like to avoid dbx corruption issues, your antivirus software and firewall should be up-to-date. Besides, we recommend preparing a backup copy of your mailbox. All of these measures may help to avoid data corruption and solve problems with Outlook Express. However, these advices are useless, if your mailbox is already corrupted and you see an error, when trying to open your mailbox with Outlook Express. In such cases, users realize, that they wasted a lot of time for needless measures and now they need another, effective solution to fix problems with Outlook Express. 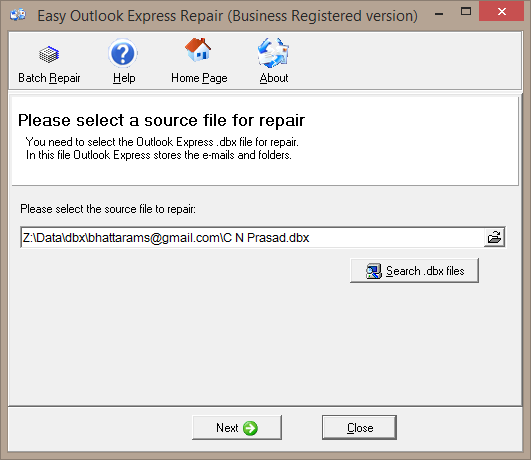 We recommend trying Easy Outlook Express Repair. This tool can help, when other solutions are inoperative and system administrators do not know, what to do. 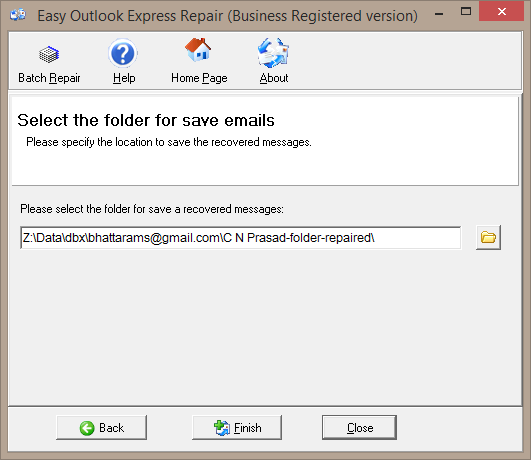 Easy Outlook Express Repair is very easy, it can be applied by all users to fix mailbox corruption issues. As opposed to other solutions, Easy Outlook Express Repair will never waste your time for precautionary measures or extra settings. This tool is so easy, that you can not to read manuals, the interface of Easy Outlook Express Repair OE recovery and Outlook Express repair tool is so simple, it represents two easy steps, in the end of the last one, your mailbox will be completely repaired. Please note, that in some cases your mailbox may be partially lost without Outlook Express dbx recovery. If the file system is seriously corrupted and the mailbox contains viruses, Easy Outlook Express Repair will not be able to retrieve some emails. So, we recommend not to wait, until your mailbox will be completely destroyed, try this program now and avoid the consequences for your business. Any user can get Easy Outlook Express Repair from our website and start mailbox recovery and fixing outlook Express 6 problems right now. Make sure, that it is as easy, as we say and that it works better, than other data recovery solutions. Despite its ease, we welcome your emails, if you have any questions, our support engineers are ready to help. If your copy of Easy Outlook Express Repair Outlook Express recovery tool is already registered, we recommend quoting your order number as well as the registration name, it may help to accelerate our response with regard to .dbx recovery and fix Outlook Express 6 problems. If you have already launched this program for Outlook Express dbx recovery, start with the very beginning and select your mailbox in dbx format. In the most cases, Easy Outlook Express Repair can find this file automatically, but this program will be unable to do it, if it was replaced from its default location. If its current path was modified, you may enter it manually. When done, press Next to proceed and start mailbox analysis and fix Outlook Express problems. After this, users can preview repaired messages and make sure, which of them will be restored. Easy Outlook Express Repair can extract separate files of eml format to any forder upon user's choice, it can be performed for all supported versions of Outlook Express. 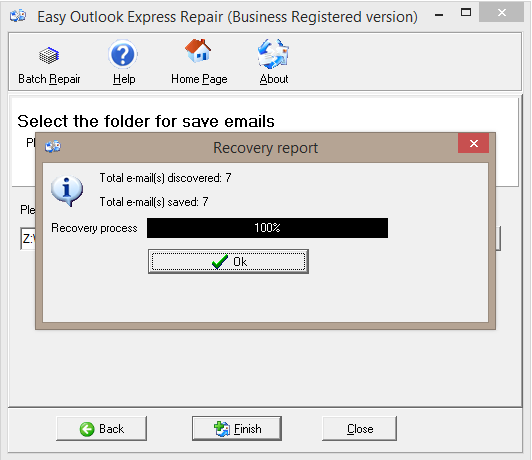 Easy Outlook Express Repair can become a reliable guard for your mailbox, this tool helps, when other means are of no avail. Owing to the fact, that there are restrictions in free demo version, users can save only ten files in eml format. 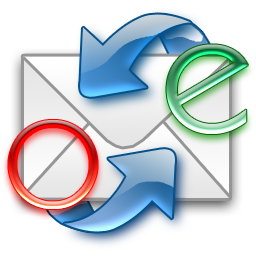 If you'd like to restore the whole mailbox, we advise purchasing full version, where there are no restrictions for rebuild Outlook Express and fix Outlook Express problems. Visit mail-repair.com website and get acquainted with the professional software team development of Easy Outlook Express Repair and corresponding communities to stand against various threats, occurring in DBX files. Keep in mind it is not GNU General Public License (GPL), freeware or open source so the users of Easy Outlook Express Repair should donate to remove all restrictions of free version and start rebuilding DBX Outlook Express file.